—although technically at the moment he is just some dude in Colorado. 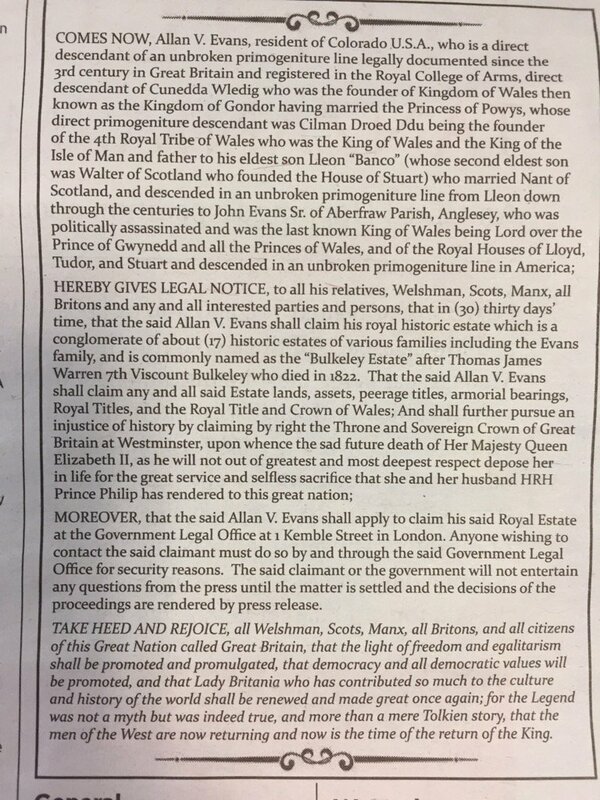 This spectacular paragraph is from a notice that appeared in the Times of London on Wednesday (p. 53), and quickly reached America via Twitter (@DavidMapstone). The notice names one Allan V. Evans, currently a “resident of Colorado U.S.A.” but, obviously, so much more. Potentially. [Evans] shall further pursue an injustice of history by claiming by right the Throne and Sovereign Crown of Great Britain at Westminster, upon whence [sic] the sad future death of Her Majesty Queen Elizabeth II, as he [Evans] will not out of greatest and most deepest respect depose her in life for the great service and selfless sacrifice that she and her husband HRH Prince Philip [have] rendered to this great nation…. Let it not be said that King Allan I was cruel. TAKE HEED AND REJOICE … that democracy and all democratic values will be promoted, and that Lady Britania [sic] who has contributed so much to the culture and history of the world shall be renewed and made great once again; for the Legend was not a myth but was indeed true, and more than a mere Tolkien story, that the men of the West [i.e. Colorado] are now returning and now is the time of the Return of the King. We don’t need to address every fact here to see that there are some problems with King Allan’s claim to the throne. But let’s start with the first one: that he is the result of an “unbroken primogeniture line legally documented since the third century.” Well, even if there were lines going back that far, and the Romans didn’t break them, there aren’t going to be records to prove it. For example, Allan mentions an ancestor named “Cunedda.” According to A History of Wales by Sir John Edward Lloyd (1911), Cunedda and his eight sons (among others) “came from the North, from Manaw Gododin [Scotland], and drove out the [Gaels] from Gwynedd, with very great slaughter, so that they never returned.” This is said to have happened in about 450, so basically around the time of King Arthur—legendary, in other words, and not well documented. In fact, the main source for the Cunedda story is the Historia Brittonum, not written until 400 years later. It’s not impossible that some sort of “royal line” survived, of course, but it would be almost impossible to prove or disprove it. Since I think it’s safe to say Allan has the burden of proof here, that is a problem for him, not us. Next: “Kingdom of Gondor.” I’m certainly no expert in Welsh history, or language, or anything Welsh, really, so if you are, please weigh in. But I can’t find any references at all to any part of Wales ever having been called “Gondor.” J.R.R. Tolkien was a fan of the Welsh language (among others), and there are apparently theories that he modeled Gondor on Wales, although that makes no sense to me. Because Allan refers to Tolkien again near the end of his decree, he might be confusing those theories with actual Welsh legends. Or he might just like LOTR and be confused in general. Finally, there was a “Thomas James Warren, 7th Viscount Bulkeley,” who died in 1822. But since he died “without issue,” it seems rather unlikely Allan is descended from him. So even if Allan did have some claim to part of an area known as the “Bulkeley Estate,” it wouldn’t be Bulkeley’s part. But then Allan Evans has a history of claiming things that don’t belong to him. As you may recall, in 2012 he showed up in Twiggs County, Georgia, and told 35 people there he had an ancestral claim to all their property. He had no proof, he explained, only because the records had all been destroyed when the courthouse burned down in 1901. Probably he will have a similar “the Romans burned all the records” explanation when he shows up in England, but that didn’t go over too well in Georgia. See “Twiggs County Landgrabber Loses, Must Pay $100K in Fees” (Nov. 16, 2012). I noted then that Evans had appealed the ruling. It seems to have gone directly to the Georgia Supreme Court, probably because it involved title to land. On June 3, 2013, the court affirmed unanimously, though unfortunately without a written opinion explaining why. I would guess it had to do with his complete lack of evidence to support his claims. I don’t know whether Evans ever paid the $100,000 he was ordered to pay for bringing that frivolous lawsuit. It’s a lot of money, but I guess in another 28 days or so, all his financial problems will be solved. He should probably learn to spell “Britannia,” though. I think that’s a requirement.